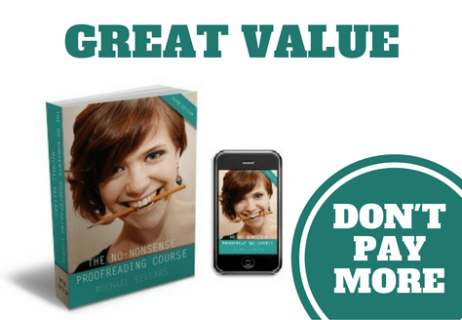 A proofreading course that doesn't cost a fortune! At last! Instant download! Start learning today! Earn $35 per hour! Find out why you don't need to spend a small fortune to learn to proofread. A proofreader with more than a quarter of a century of proofreading experience. 20 FREE proofreading exercises for you to download. Answers included. with copies sold throughout the USA and worldwide. I am one of those many fools who paid a huge amount of money for a useless course. Hindsight is a wonderful thing and, unfortunately, I didn’t come across Mike’s website until it was too late. We live and learn. I now work with clients across the globe and it was Mike that gave me the tools and the confidence to go out there and do it. ​“I am one of those many fools who paid a huge amount of money for a useless proofreading course. This book has opened so many doors for me. I now look on Mike as my mentor as I embark on a career. Thank you Mike.” Emma Steel, Proofreader and International Structural Editor. “I thoroughly enjoyed the proofreading course and am so glad that I decided to take it... the whole experience was invaluable. My... proofreading service is now well established and your course played no small part in getting it off the ground.” Hache L. Jones, Proofreader. “I'd just like to thank you first of all for writing such a great, straight forward guide, and then going above and beyond what I would even expect as a customer by providing us, completely free of charge, updated versions months later!” Rachel Gee, Trainee Proofreader. “What can I say? Worth every penny and then some! God Bless! This a fabulous proofreading course.” Teresa Richardson, Proofreader. 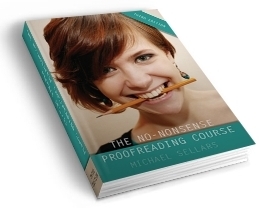 ​“As someone who has effectively been proofreading for thirty years, I found Mike’s No-Nonsense Proofreading Course an invaluable introduction and a very useful practical guide to many aspects of this discipline. I can wholeheartedly recommend it as the ideal starting point, and much more besides.” Jeremy Meehan, Proofreader. A friend of mine, knowing that I was an Operations Manager in the publishing department of a large online retailer, revealed, over coffee, that his brother had just completed a proofreading course and was on the lookout for freelance opportunities. I’d honestly never heard of such a thing. In the 12 years I’d been in the employ of this particular organisation, I’d worked with at least a couple of dozen proofreaders; I’d interviewed and hired several proofreaders, both permanent and freelance; I’d been responsible for the training and personal development of a number of proofreaders. And not one of them had possessed any formal proofreading qualification or boasted membership of any official proofreading order. Nor had any of them attended a proofreading course of any description. I myself had signed my name to countless proofs and had never attended so much as a seminar. “Oh, you know, the official one,” my friend replied. Official? It appeared there was so much I didn’t know about proofreading, despite having worked with proofreaders for more than a decade and having applied my own steady eye, keen judgement and red pen on literally hundreds of occasions. I tried to conceal my dismay. A week or so later, over a couple of beers, my friend showed me this ‘official’ proofreading course. It consisted of a couple of manuals, boasting about three hundred pages in total. I hefted the spiral-bound volumes in one hand. I opened the first volume and flipped through it. “What do you mean ‘padding’?” he asked. That sounded like a challenge, and I’ve always quite liked a challenge. 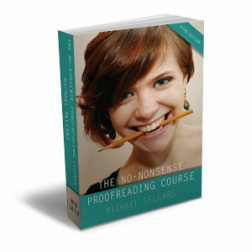 The No-Nonsense Proofreading Course, a downloadable guide, full of nothing-but-useful information, that will set you back a mere $48.99.